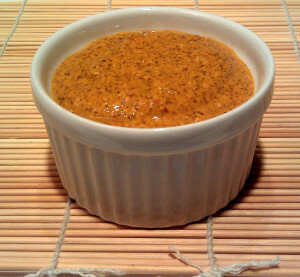 This mustard is easy to make and has ton of awesome flavor without being too spicy. It grew out of my desire to have a spicy mustard that could stand up to a great cheddar cheese, hot-dog or salami, without overwhelming it, and without costing $5 for a tiny jar. Besides, if you ever find yourself on Chopped, now you can have mustard even if there isn’t any in the pantry! Mustard seeds are another one. They’re $8 for a little jar in Price Chopper, but $2 for a 14 ounce bag in the Asian and Indian markets. Put the spice mixture (above) into a blender with the ground turmeric and sugar. Add Guinness as necessary to keep the mixture smoothly flowing in the blender. Stop and check the consistency. It should be about the same thickness as store-bought brown mustard. Add more Guinness if too thick. Turn off the blender. Let sit, and check the heat level every few minutes, for up to 15 minutes. It will increase over time. When it’s hot enough, restart the blender and add the vinegar, which will stabilize the heat level. Transfer to a clean glass jar (I usually use a clean peanut butter jar) and refrigerate overnight to let the dry ingredients fully absorb the liquids.